What would you do about this OFer, Marcell Ozuna? Zander Wiel had a big night, leading the Chattanooga lineup to an impressive output in support of Lewis Thorpe. Also, Willians Astudillo hit his 10th home run for the Red Wings and Ryan Jeffers had another multi-hit game for Cedar Rapids. Come check out the rest of Thursday’s edition of the Minor League Report. Welcome to an impromptu speed round edition of the Minor League Report. Hold onto your hats! -Ryan Walker and Paco Rodriguez were released from Chattanooga to make room for Luke Raley and Devin Smeltzer. -Tom Hackimer was placed back on the 7-Day DL and Dylan Stowell was promoted from the GCL to the Miracle to fill his spot on the roster. Game 2: Suspended after two innings due to rain. 5. Stephen Gonsalves (ROC): Did not pitch. 17. Lewin Diaz (FM): Out with an injury. Rooker and Wiel continue to mash at Chattanooga.Rooker's performance is kind of special considering he was drafted less than 14 months ago. Meanwhile, Luis Arraez has hit safely in 9 of his last 10 games with two multi hit games in his last three.Hitting .342 over that 10 game stretch tells me he is making the adjustment to AA and must be considered a candidate for the Twins second base spot by 2020, if not sometime next year. Lewis Thorpe had a solid, if not great, outing last night.I see he has pitched about 25% more innings than last year.Will his arm begin to tire and he will be less dominant as the innings build? I see they worked Raley into the Lookouts lineup in right field with Wiel at first and Rooker in left. Good question about the possiblity of Thorpe starting to get tired as the long season --- well, long for him due to his long period of inactivity --- nears an end. Might it be time for the team to shut him down, or does it really matter? I realize he's not a prospect, but I'd love to see Willians Astudillo called back up to the major league club again. Seems like all he does is get hits. Wiel has been consistent all season long.His OPS is right there with Rooker and Raley how come he gets no top 30 love?Age? Late Bloomer?FanGraphs has Jaylin Davis at number 16 on their list and his OPS is much lower than Wiel's. Wiel has a much better eye at the plate than Rooker and Raley as well as his K rate is 20% and theirs is around 30%.I know this may be his first standout year but he has been consistently good throughout the year so the numbers do not appear to be flukey.What will it take for this guy to get some love? He kind of reminds me of Glenn Williams and Josmil Pinto. They weren't that good and it's not like they had a long future in the majors (not a ton of power) but they put together a hot stretch when the debuted. Glenn Williams might be my favorite stat of all time. He played 13 career games and got a hit in every game, tying the MLB record. In that 13th game he hurt his shoulder diving back into 1B and never played in the majors again. Moonlight Graham-esque! Amazingly for Glenn Williams too was that three of those 13 games involved him pinch-hitting. He only got once chance to get that hit. I love FanGraphs, Kiley and Eric are great, but I cannot endorse their prospect rankings. I don't know if they're using old grades still or what, but there's some weird stuff going on there. I had Wiel in my top 40. He's been a consistent performer throughout the minors, but age, position and lack of big power is going to keep him from shooting up lists. A .385 OBP works no matter who you are or what you play, but that's mostly supported by a .378 BABIP right now. I think for him to really get some love there's going to need to be more power, but he's among my favorite players in the system. I have no idea if it'll translate at the higher levels, but the dude is just a good baseball player. Gordon either needs to find a spot on the DL or on a bus to Tennessee. He has been brutal at aaa and I can't believe this is a positive to his development. Maybe he is working on a specific thing though I think he just isn't ready for this level. Any update on why Wade left after 3? Being a good AA hitter at age 25 doesn't make someone a prospect, particularly when he lacks defensive value. Wiel doesn't project as a Major League contributor and therefore he is not considered to be a noteworthy prospect. I agree with your statement about Wiel. He hasn't hit double digit home runs yet this year and Rooker is at 20 and Raley 17.But he is right there with both of them when it comes to doubles.I hadn't looked at BABIP so you are right he will be due for some regression.But even with normalized BABIP his eye at the plate right now is better than the other two.One thing we know about the higher levels and that is that batters don't typically strike out less so he has an advantage there. The next level will probably tell the tale for all three of those guys as they will face a lot more junk\breaking balls in AAA.Hopefully Weil works just a bit more on muscling balls over the fence and then he should get his shot. I think they keep putting him out there for most of the month.Try to stretch him out to at least 125+ innings (currently at 103).That would be four more starts.Maybe they begin to pull him earlier in the game, although last night he went to 99 pitches.If they get 125+ this year, he will be on track for 160 or so next year when some of those innings should be at Target Field. Rooker could be 24 at AA if he starts there next year. So not that much different in age in my mind, but yeah I get your point Wiel will be 26 next year so his prime years are coming. Hard to be much of a prospect when you should be in the majors.Still his numbers are good this year. Rooker isn't going to be in AA next year, but in any case his age weighs on his prospect status too. The difference being that Rooker has better tools (particularly power) and is 2 years younger than Wiel at the same level, which is why Rooker is a solid (but not elite) prospect and Wiel is a fringe prospect. Doesn't appear he was injured... Maybe he had to catch a flight?! Yeah I searched high and low to see what's up. Didn't see an injury reported in the game recap either - so that's my hope. Fingers crossed! I may just tune in again if he replaces Grossman. He did make the last put-out on a fly ball in the bottom of the second and didn't bat in the top of the third, which suggests he hurt himself on the catch... or he had to catch a plane! I have no information, just speculation, but it certainly seems like a LaMonte Wade promotion may be happening. Grossman is not part of a WS contending team, imo. Wade might be a backup OF on such a team. And, who the heck knows what Buxton will be next year. This team needs Wade in MN, to gather data, and to let him adjust to the majors, in case they need someone in the field next year with Rosario, Buxton, Kepler, Cave. Hope they keep Rooker moving. Would be nice if he got AAA at bats this year yet.Maybe he can be ready for the Twins next year. Jake Depue of 1500ESPN has relayed via Twitter that Wade was removed for "precautionary reasons." poop. I was really hoping he was being promoted. I think his age has something to do with that.But yeah, he's doing what you want him to do. 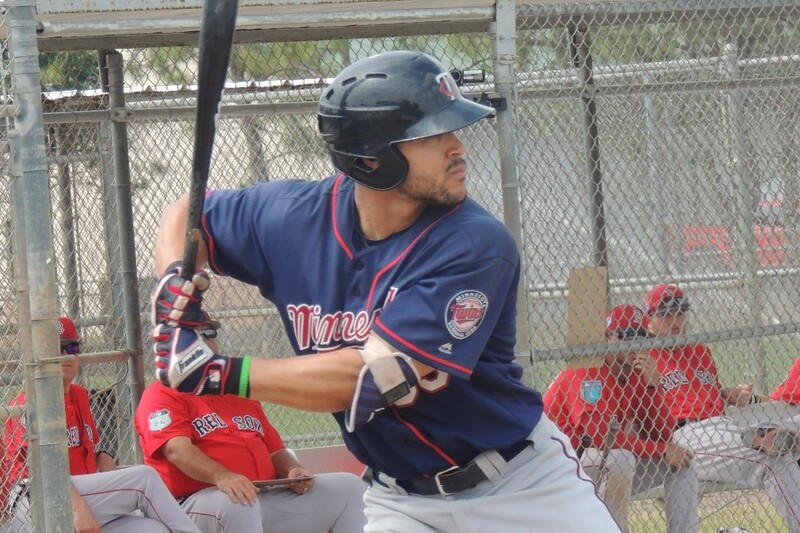 Twins Minor League Report (4/13): We Are Talking About the Same Sport, Correct?